Ningxia, as part of the 黄土高原 (Huangtu Gaoyuan), known as the Loess Plateau, is primarily made up of arid mountain chains and high-altitude plains. It is important to mention the Loess Plateau because it’s thanks to this that the Yellow River got its name: Loess is a sedimentary rock that gives a yellowish color to the waters of this famous river. In any event, be careful when choosing the right time to go to Ningxia: autumn is cold, winter is long and freezing, summer is hot and dry, but Spring is a nice season aside from the fact that it rains a lot. The average annual temperature varies between 5 to 9 degrees Celsius. Ningxia continues to be one of the poorest areas of China, characterized by an economic disparity between the northern area (which is richer and more fertile) and the southern one (dry and scarcely populated); Ningxia’s economy is largely based on its mineral riches (about 34 types of minerals). To close this brief introduction only one thing remains: the highest peak, 苏峪口 (Suyukou), has an altitude of 3,566 meters. Before going on with the article, I would like to mention three reasons to go to Ningxia: one historic, one cultural, and one adventurous. 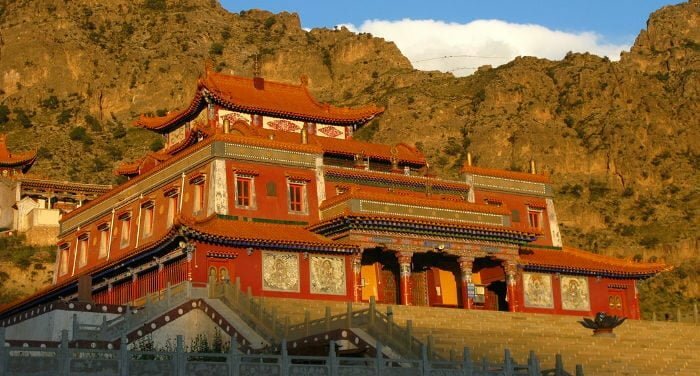 Ningxia, long contested by the Mongolian and Chinese empires, is today rich with historical evidence: Buddhist statues, royal tombs of very ancient dynasties and cave inscriptions. Ningxia was a frontier area that separated nomadic breeders and sedentary farmers, a fact that made it a very appealing land for the “non-Chinese”. The empire then sent its legions to reclaim the land, making Ningxia a battleground for a long time. From a cultural point of view, Ningxia is interesting because it is inhabited by the Hui Muslim ethnic minority. This minority has many distinctive traits: habits, food, clothing. From an adventure point of view, Ningxia offers lots of opportunities: you can camp in the desert, navigate the traditional rafts on the Yellow River (make sure that the raft is in good condition!) and you’ll have to speak Chinese because the Hui are not used to seeing Western tourists (neither are the Chinese), so it will be rare to find someone who knows how to speak English. Yinchuan (银川), the capital, is located between the Yellow River and the 贺兰 mountain chain, which shelters Ningxia’s capital from the sand brought by the winds from the Gobi Desert. Even though there’s a prevalence of Han Chinese, in Yinchuan you’ll find tons of mosques (500).Road signals are written in both Chinese and Arabic, and the cuisine is mainly Arabic. Yinchuan was the capital of the Tangut Empire Xi Xia (1038-1227). Yinchuan can be divided into three parts: the New City (Xixia Qu, 西夏区), the Central neighborhood (Jinfeng Qu, 金凤区) and the Old City (Xingqing Qu, 兴庆区). The majority of historical and cultural sites of interest (and hotels!) are concentrated in the Old City. Halfway between the New City and Old City is the 宁夏博物馆 (Ningxia Bowuguan) or “Ningxia Museum”: this is a vast, well-organized museum of 4 floors, which preserves a rich collection of ceramics that go back to the time of the Silk Road, along with very old copies of the Koran. In total there has to be about 10,000 artifacts. Inside the Old City you’ll find the famous Chengtiansi Pagoda , 承天寺 (also called the Western Pagoda, 西塔). Even though it’s been rebuilt many times (the last time after a tremendous earthquake during the Qing era), this 11 story pagoda has a height of 65 meters (note that there’s no elevator inside!) and goes back to almost 1,000 years ago. About 20 kilometers west of Yinchuan, in Zhenbeibao 镇北堡, there’s the China Western Film Studio where they’ve already made more than 200 films, such as Red Sorghum, the film taken from the novel of the same name (Hong Gaoliang, 红高粱) written by Mo Yan and winner of the Nobel Prize for literature in 2012. 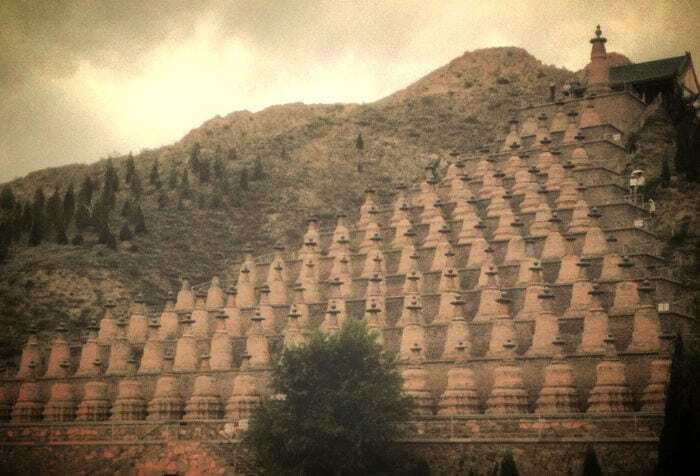 About 33 kilometers from Yinchuan, at the foot of Mount Helan, there are the famous beehive-shaped imperial tombs of the Western Xia (Xixia Wangling, 西夏王陵). Unfortunately, without special permission you can only visit one 23 meter high tomb (the tomb of Li Yuanhao). In this area there are also the most famous cave inscriptions (Helan shan Yanhua, 贺兰山岩画) going back about 10,000 years and representing more than 2,000 pictograms: animals, hunting scenes, people’s faces and even something that looks like our concept of extraterrestrials. The cave inscriptions were discovered in 1969. A dozen kilometers west of the cave inscriptions are the Twin Pagodas of Baisikou (Baisikou shuang ta, 拜寺口双塔) which are sadly not accessible but offer an amazing image standing out in front of the mountains. Among the pagodas and cave inscriptions there’s also a beautiful forest park, 苏峪口国家森林公园 (Suyukou Guojia Senlin Gongyuan), or “Suyukou National Forest Park” of about a million hectares. To best admire the luxurious green of this park, you can easily take a chairlift. This park is rich in culture and history: in fact each valley and mountain has its own name and history that you can learn onsite. 25 kilometers east of Yinchuan there’s the Shui Dong Gou archaeological site, 水洞沟, which was transformed into a park split into two parts: the first part is a museum that contains paleolithic artifacts (there are thousands! ); the second consists of an unrestored section of the Great Wall that can only be reached after spending a bit more: first you have to take an electric vehicle, then take a boat trip then a ride on a camel-drawn cart, all extra expenses in addition to the price of an entrance ticket. After this mini adventure you reach a fort with a network of galleries that contain trapdoors, false passages and once, explosive traps. In ancient times, this part of the Great Wall was a military fortress dedicated to defense. It’s a shame that there are no tourist guides who know English. Considering all the things to see and experience, Yinchuan would be an excellent starting point to also visit Inner Mongolia. Zhongwei (中卫), with its nearly one million residents who live together in a rather relaxed manner, is known for being the prettiest, most welcoming city in Ningxia; in addition, it’s the ideal place to take a nice ferry ride on the Yellow River, or, why not, an excursion out to the Tengger Desert (Tenggeli shamo, 腾格里沙漠). This desert, with a surface area of 42,700 square kilometers, borders part of the Great Wall of China while in the north it fades into the Gobi Desert. Returning to the point on hand, what is there to see in Zhongwei? First of all, there’s the very famous 高庙 (Gaomiao), or “Gao Temple”, a very varied place of worship which during its long history was used by Buddhists, Confucianists and Taoists. The Gao Temple would have been built during the time of the emperor Ming Yong Le (1403-1424). There’s a long and very fascinating history behind this very unique temple (one of the few in China to be used by such different entities), history that can be imagined through the variety that is still evident in its many architectural styles. During the Cultural Revolution (1966-1976) it was turned into a anti-aircraft shelter; now there are halls where you can see images and sculptures of the damned (most likely Buddhists) from their severed tongues and so on. This hell is composed of 9 floors where you can find different things from top to bottom. About 17 kilometers from Zhongwei, at the point where the dunes of the Tengger Desert and the Yellow River meet, there’s the Shapotou 沙坡头 recreational center (famous mainly for its research center that studies the progression and stabilization methods of the dunes). 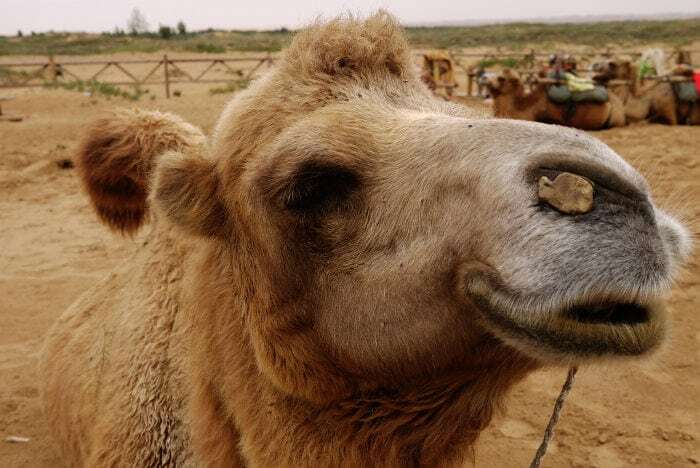 Originally it was built in 1984 for the safety and protection of the plants and animals of the Tengger Desert. Today, you can descend by hang gliding along wires that cross the Yellow River in this area; you can also do bungee jumping or go sand sledding. You can also get back on the Yellow River on a 羊皮筏子 (Yangpi fazi), or “sheepskin raft” (a traditional raft). Shapotou has become an actual amusement park; imagine that it was listed in the Top 10 most entertaining places in China! This is not even considering that in Shapotou you can have easy access to the Tengger Desert by either a guided or independent excursion. Guyuan (固原) is a small city in the south of Ningxia that isn’t a tourist destination at all. Moreover, being rather undeveloped, it’s recommended that you bring cash with you in the event that you don’t find any ATMs (even though now there’s Wechat…). This city is important because it is here that the Xia civilization was born and even today there are many traces of it. The Buddhist caves Xumi Shan 须弥山, about 50 kilometers away, are one of the city’s main attractions. The construction of these caves, located near the old Silk Road (there are lots of forts with Indian and Central Asian influences), began in 368 A.D., even though the caves were rebuilt several times. Today, these caves were put on the list of the 100 most vulnerable sites because they’ve often been damaged by earthquakes, sand erosion, acts of vandalism and a rather apathetic administration. The 132 caverns, or caves, house more than 300 Buddhist statues that go back to around the year 1,400, Tibetan inscriptions (about a dozen), eleven stelae, and even more. Cave number 5 (clearly the numbers came later) holds a very large statue portraying the Maitreya (the Future Buddha), some 21 meters high. The most beautiful statues are protected by the Yuanguang and Xiangguo Temples, where you can comfortably enter to see the statues better, many of which retain their original color. From the decorative elements found in these caves, many historians have reached the conclusion that they were once the dwelling place of Buddhist monks. Linguistically speaking, “Xumi” is the Chinese transliteration of the Sanskrit term “sumeru”, which indicates the Buddhist paradise. Another place that absolutely deserves a visit is 六盘山 (Liupan Shan), or “Mount Liupan”, (2,928 meters tall): the place where according to many historians Gengis Khan was buried in 1227. The legend says that Gengis Khan got sick and reached this mountain to heal himself – unsuccessfully – with medicinal herbs. This is probably just a legend (it’s likely he died elsewhere), but in any event this legend was taken advantage of for purposes of tourism. In 1935, Mao Zedong came to Mount Liupan and later composed a collection of poems called 《清平乐·六盘山》(Happiness and peace, Mount Liupan). Not to be missed is also the Mount Liupan National Forest Park (the entrance fee is around 70 Yuan). I hope that this brief description has given you the desire to visit this little-explored land. As you can see, there are few tourists and Ningxia is still one of those few areas where a Westerner is looked at with great wonder and curiosity. Visiting Ningxia is certainly one of those few experiences that will let you find the China that once was and that is slowly disappearing.